Suicide. Despite its growing prevalence in modern society, few filmmakers tackle this issue, at least not in a serious fashion. 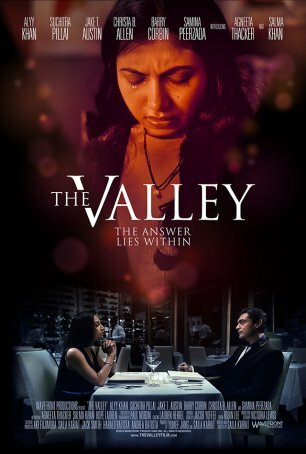 The Valley, set in California’s tech-heavy Silicon Valley, examines the impact of a young woman’s suicide on those who loved her, especially her father, Neal (Alyy Khan), who is incapable of understanding what drove her to take such a decisive action. The film plays out like a mystery, skipping back and forth across three time periods (one prior to the suicide, one immediately after, and one a year later). As the primary officer of a tech company, Neal is used to finding solutions but what he learns as he talks to the friends of his college freshman daughter, Maya (Agenneta Thacker), is that sometimes there is no single cause. Maya didn’t kill herself because she was molested at a party (which she was). She didn’t kill herself because she got a D on an exam (which she did). She didn’t kill herself because she was lonely and had few friends. Writer/director Salia Kariat provides ample evidence that Maya suffered from depression. The signs were there but Maya’s family didn’t recognize them. They thought she was being moody or sad. The movie avoids the trap of seeming like a PSA. Although there are times when the narrative veers into overripe melodrama (the “revelations” conveniently uncovered in Maya’s journal being an example), it mostly strikes the right balance between reflection and tragedy. The catharsis, to the extent that there is one, is muted as befits a story of this nature. Kariat doesn’t manufacture an artificially upbeat or satisfying conclusion to placate viewers left unsettled by the story. The Valley opts for realism rather than a pat resolution. Suicide is devastating and recovery can be slow; The Valley acknowledges both of these things. The two best developed characters are Neal and Maya. Although we only see the 18-year old in flashbacks, there’s enough to paint a picture of a smart, caring young woman overwhelmed by circumstances and without an outlet. The film’s unanswered question is whether Maya’s suicide could have been prevented. Had someone recognized her depression during the earliest timeframe, would it have been possible to stop the leap out the dorm-room window? No one knows and Kariat doesn’t stack the deck one way or another. Neal grapples with guilt and self-doubt as he struggles to understand why his daughter did what she did. His wife, Roopa (Suchitra Pillai), and eldest daughter, Monica (Salma Khan), don’t understand his obsession. In their view, Maya is dead and the reasons are immaterial. Life demands that they grieve and move on, but it’s not that simple for a Type-A personality. Like a detective solving a murder, Neal interviews everyone who knew Maya – her best friend, her roommate, the young man she had a crush on, the professor who gave her a bad grade. In the end, he recognizes that there are no answers, only more questions and the nagging suspicion that he, blinded by the demands of his job, missed seeing his daughter’s distress. By making the key participants in The Valley an Indian-American family with many traditional values and customs, Kariat emphasizes the universality of the problem. Suicide isn’t restricted to one culture or social class. It crosses all lines and is no respecter of ethnicity or financial status. With solid performances and a sensitive screenplay, The Valley offers a window overlooking a heartbreakingly common situation whose signs and symptoms remain elusive.